This is the real independence day for Mexico, not Cinco de Mayo. Today, September 16 is the day when we do the “grito” to declare independence from Spain in 1810 by the Mexicans after 300 years of colonial rule. “El Grito de Dolores” was given as a speech by the Rev. Miguel Hidalgo y Costilla, a priest who called his congregation to fight against Spain. How to celebrate depends on who you are and where you live. If you live in San Diego, there’s a huge event tonight at the Spreckels Organ Pavilion in Balboa Park that will begin at 6:30pm. If you live near a border, there’s likely an event in your town similar to this. I spent Mexican Independence Day in San Antonio a few years ago, and they celebrated in a big way. The streets were filled with excitement and fun. You may be seeing mariachi bands, ballet folklorico groups, cultural art and great food and drink. You can continue to celebrate right through Oct 15, calling on the holiday, National Hispanic Heritage Month. Five other Latin American countries celebrate their independence during this time. Now is the time to celebrate and give your “grito”, to shout out for freedom. 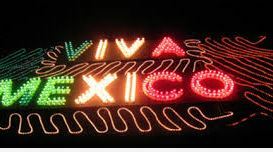 Viva Mexico. Just beneath, are various totally not connected internet sites to ours, however, they’re certainly worth going over.